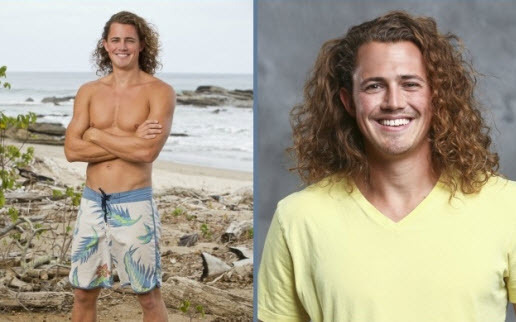 Survivor 2015 Second Chance cast member Joe Anglim came in a lowly 10th place his first time around on the series. Even with his lackluster placement, however, he was obviously a fan favorite, as he was one of 20 players voted onto Survivor Cambodia by the public. This time around, he has more of a laid-back strategy going into the game, and hopes he will make better choices about who he will team up with. Joe Anglim was a member of the “no collar” Nargarote Tribe on Survivor W0rlds Apart and quickly set himself apart as a leader in the Nagarote Alliance. Unfortunately, this led to him becoming a big target for elimination, and he was ousted by a rival alliance. Joe is from Arizona, and all around Arizona at that, as his nomadic lifestyle goes. He is an artist art heart, and designs jewelry among his other talents. He grew up on a citrus farm which gives him a farmboy feel, so he says, though his friends think of him as a MacGyver sort of character which should hopefully come in helpful on Survivor 2015 Cambodia. “It’s all a numbers game,” Joe Anglim said in his Survivor: Worlds Apart cast interview. Back then, he said he strategy was to figure out when someone was going to go after him, and get to them first. For the new season of Survivor 31, Joe has changed up his strategy a bit, going for a more mellow, more under the radar approach. Click thumbnails images for full size or to flip through. In his CBS Survivor cast profile from Worlds Apart, Joe Anglim said his biggest claim to fame was winning a state basketball championship in his senior year of high school. He has always dreamed of being on Survivor since he first watched the series, and says it is a true test of self-awareness as well as mental, physical and emotional determination. Joe is a big believer in Karma, so he’s not thrilled with all the lying required to play Survivor, but he understands it’s all part of how things work. Joe is ready to look his fellow castaways in the eye, tell them they’re safe, and then write their names down. Beyond the game, however, Joe says he really wants to enjoy himself even more than he did the first time around. The big difference, he says, is that he plans on making it all the way to the end this time. We’ll see if he can make that wish come true when Survivor Cambodia Second Chance debuts on September 23, 2015.